I am looking for energetic, enthusiastic, and CREATIVE team members! Do you have what it takes? CT members receive my products for free in return for their pages! I also love to hear ideas from my team and take a lot of their input and incorporate it into my kits and templates. I am looking for a variety of layout styles, so don't be shy! Apply! GOOD LUCK!! Get those apps in! I can't wait to hear from you! Download the FREE template above and make a layout. Upload it to your most current gallery. 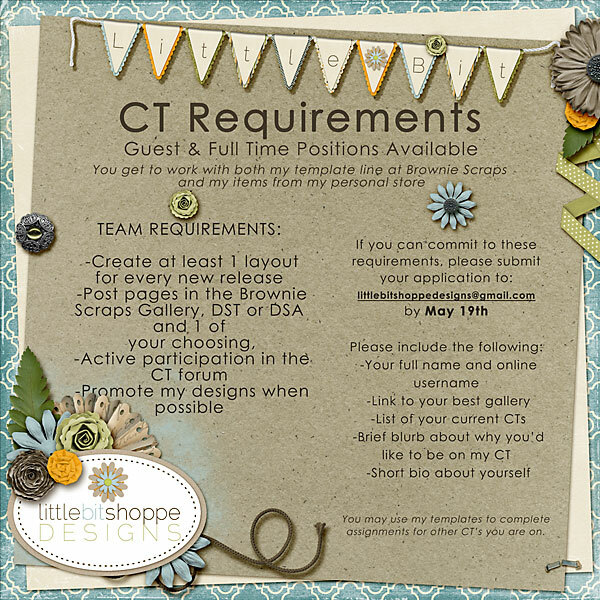 Be sure to credit the template, "CT Call Template by Little Bit Shoppe Designs" Send me a link to the layout you made using the layout. I want to see your creativity come alive! I'd love to see your spin on the template and how you can make it your own. I will also be looking for shadows and how they are used to create a more realistic page. Thank you so much for this post. I want to let you know that I posted a link to your blog in CBH Digital Scrapbooking Freebies (please, notice the new url for my blog), under the Page 2 post on May. 06, 2012. Thanks again.